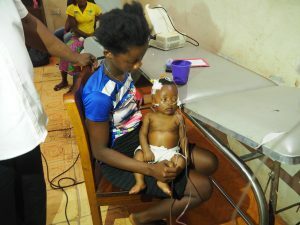 Five visitors from One World Link went to Bo in Sierra Leone. They were 2 midwives, a health visitor, an OWL founder member, and a young 13 year old – son of the leader, Helena White. Jane Knight was the first visitor to Bo in 1981, when she invited the people of Bo District to join hands with Warwick District to form a friendship link. 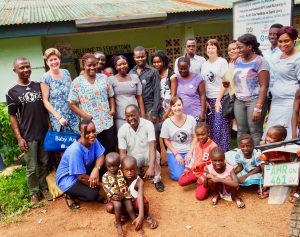 Helena is a local midwife who has trained many midwives and birth attendants in various Sierra Leonean clinics and hospitals. Since 1981, strong school and local government links have been formed with some church, youth, library and individual links coming and going. Meanwhile, young Will White went out and about making football links, from which he may be able to build up the interest of his peers. Jane Knight, on this, her last visit, was able to see the enormous progress made in all aspects of the 37 years of OWL’s existence. For example 10 years ago, she was involved in the initiation of a waste management programme for Bo, supported by Warwickshire County Council. This small initiative has now grown into a huge programme funded by the British government (DFID) to bring effective waste reduction and management to all the major cities in Sierra Leone including the capital city Freetown. How small acorns can grow! 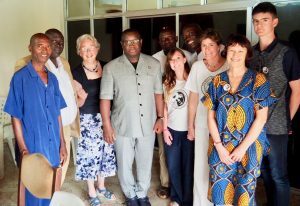 The highlight of the visit was a meeting with President Maada Bio who was elected last March, and he is already making significant changes to this beautiful country. He has introduced free education for all and has made commitments to improve roads which have been left to the ravages of rainy seasons for years. When asked whether health would be a priority for him, he responded that education could not be properly implemented without good health for all. He grew up in a village, lost his father when aged 4, had an illiterate mother, but has now several degrees and is an ex Brigadier. Hence his commitment to education as a priority. The President visited Leamington in 2016 and it was a great thrill to see him now in post – such a great triumph for democracy in Sierra Leone. This first health group visit was very fruitful and Helena and her colleagues, Sarah Galloon, and Katrina Moss, will be happy to recruit other health specialists to join them to contribute with skills and resources. Jane Knight sadly said goodbye to long standing friends in Bo and hopes that OWL will continue for another 37 years. OWL will be hosting and sending out planners, more health experts and teachers next year.